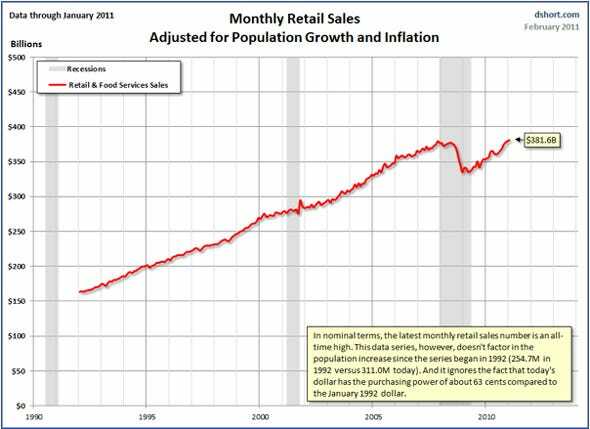 The February 2011 Advance Monthly Sales for Retail Trade and Food Services Report for January was released this morning. Here is the opening paragraph of the report. The U.S. Census Bureau announced today that advance estimates of U.S. retail and food services sales for January, adjusted for seasonal variation and holiday and trading-day differences, but not for price changes, were $381.6 billion, an increase of 0.3 per cent (±0.5%)* from the previous month, and 7.8 per cent (±0.7%) above January 2010. Total sales for the November 2010 through January 2011 period were up 7.6 per cent (±0.5%) from the same period a year ago. The November to December 2010 per cent change was revised from +0.6 per cent (±0.5%) to +0.5 per cent (±0.3%). * The 90 per cent confidence interval includes zero. The Census Bureau does not have sufficient statistical evidence to conclude that the actual change is different than zero. The 0.3% number is disappointing. The Briefing.com consensus estimate was 0.5% and its own estimate was 0.7%. The chart below shows the complete data series from 1992, when the U.S. Census Bureau began tracking the data. I have highlighted recessions and the approximate range of two major economic episodes that have impacted consumer attitudes. The Tech Crash that began in the spring of 2000 had little impact on consumption. The Financial Crisis of 2008 has had a major impact. 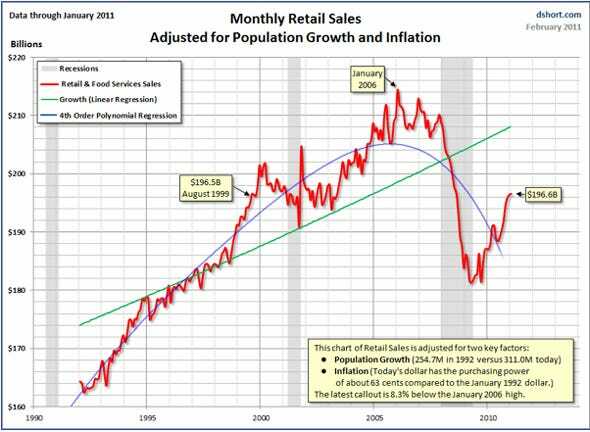 The January retail sales take us in nominal terms a mere 0.4% above the previous high of November 2007. Here is the same chart with two trendlines added. These are linear regressions computed with the Excel Growth function. The green trendline is a regression through the entire data series. The latest sales figure is 8.1% below the green line end point. The blue line is a regression through the end of 2007 and extrapolated to the present. Thus, the blue line excludes the impact of the Financial Crisis. The latest sales figure is 16.1% below the blue line end point. We normally evaluate monthly data on a month-over-month or year-over-year basis. The January 0.3% increase over December and 7.4% over January 2010 look reasonable, if somewhat disappointing. But a snapshot of the larger historical context illustrates the devastating impact of the Financial Crisis on the U.S. economy. 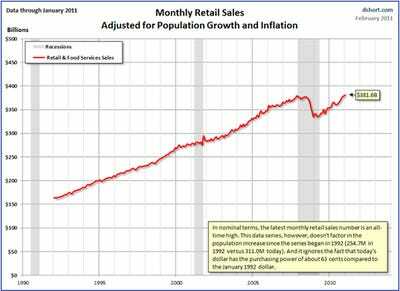 The chart below is the one that tells us the most about the U.S. retail economy and the long-term behaviour of the consumer. The sales numbers are adjusted for population growth and inflation. Consider: During the past 21 years, the U.S. population has grown by over 22% while the dollar has lost about 37% of its purchasing power to inflation. 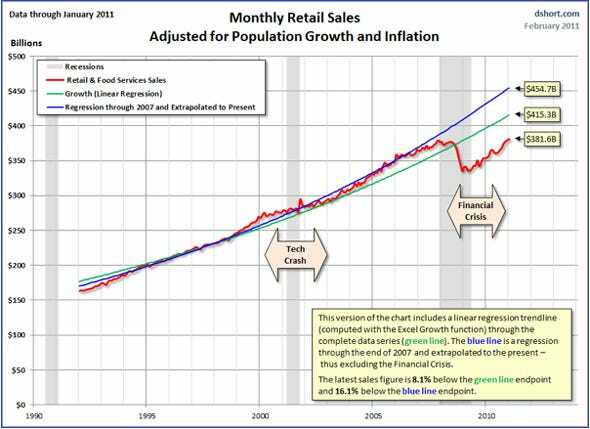 When we adjust accordingly, the rebound in retail sales from the bottom in April 2009 merely gets us back to the per capita spending during the late summer of 1999. 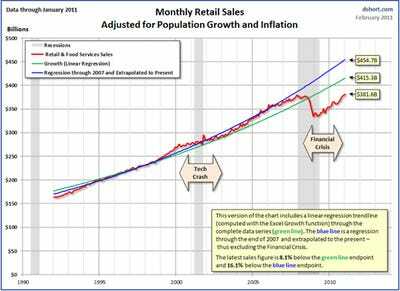 Retail sales have been recovering since the trough in 2009. 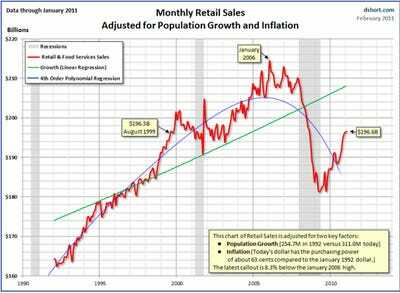 But the “real” consumer economy, adjusted for population growth still in a state of depression — 8.3% below its all-time high in January 2006. Note: For the mathematically inclined, I’ve included a linear regression and a best-fit polynomial regression. The inflation-adjusted series is chained to the January 1992 dollar when this series began being reported.